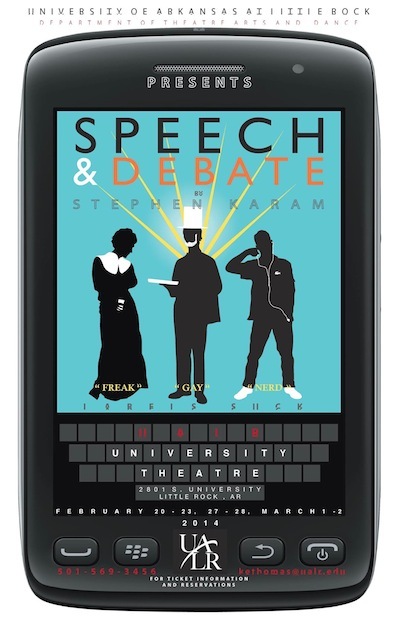 Stephen Karam’s award winning comedy Speech and Debate continues at UALR through this weekend. It is being performed at 8pm Thur and Fri, 7pm on Saturday and 2:30pm on Sunday at the University Theatre on the UALR campus. This production is directed by visiting professor, Robert Neblett. The play, a dark comedy with music, concerns three misfit teenagers, Howie (openly gay), Solomon (nerdy), and Diwata (frumpy and obsessed with musicals), and their attempts to expose a drama teacher who preys on teen boys. It employs humor and dance as it explores this. Each of the scenes is a title of an event in competitive forensics. This entry was posted in Theatre and tagged Robert Neblett, Stephen Karam, UA Little Rock, UA Little Rock Theatre and Dance, University of Arkansas at Little Rock by Scott. Bookmark the permalink.